Skinny Revisited offers a thorough overview and etiological explanation of anorexia as an eating disorder. Writing from a feminist sociobehavioral perspective, Baratta forges an argument about the role that our culture at large plays in creating the environment for disordered eating among women. Women are constantly bombarded with messages from the media to value "skinny" and to strive for thinness, no matter how great the dangers. Despite its seriousness, anorexia can be treated, and Baratta presents a treatment model that teaches how to engage an anorexic in such a way as to encourage eating. On the basis of 28 years of clinical practice, the author provides clinical cases that demonstrate the use of the "language of the anorexic" as a treatment intervention. Finally, the book explains how to create an individualized, healthy eating plan as opposed to following a diet designed to be applicable to anyone struggling with an eating disorder. 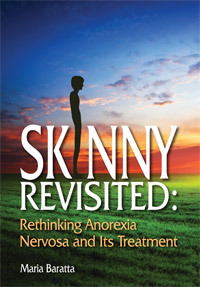 For anyone with a professional, academic, or personal interest in anorexia nervosa, Skinny Revisited is a good resource.